Inquisition -- During most of the 16th and 17th centuries, fear of heretics spreading teachings and opinions that contradicted the Bible dominated the Catholic Church. They persecuted scientists who formed theories the Church deemed heretical and forbade people from reading any books on those subjects by placing the books on the Index of Prohibited Books. A type of war between science and religion was in play but there would be more casualties on the side of science. John's weekly update on graft, corruption and waste in clean energy. If Democratic attorneys general can pursue climate change skeptics for fraud, then also at risk of prosecution are climate alarmists whose predictions of global doom have failed to materialize. The “cuts both ways” argument was among those raised by 13 Republican attorneys general in a letter urging their Democratic counterparts to stop using their law enforcement power against fossil fuel companies and others that challenge the climate change catastrophe narrative. Healey’s office subpoenaed Exxon as part of a multi-state effort among liberal attorneys general to investigate Exxon for allegedly trying to cover up global warming science. Schneiderman, [NY AG], hosted a conference in March with other AGs, including Healey and Walker, where it was announced that more prosecutors would probe Exxon and fight back against Republican attacks on federal environmental regulations. What follows is a copy of Attorney General Maura Healey’s prepared remarks to the NECA Renewables Conference minus her introductory statement. Today, I would like to talk to you about my vision for a clean energy future and my plan to serve as a 21st Century ratepayer advocate. The clean energy sector is now a $10 billion dollar industry in Massachusetts, employing 88,000 workers in 6,000 firms, primarily in the renewable energy and energy efficiency fields. Between 2013 and 2014, clean energy employment grew by 10.5 percent—that is eight times faster than the state’s overall job growth rate. This year, clean energy employers expect to add another 11,700 jobs. These are good, quality, long‐term jobs. The clean energy sector is vitally important to our future. This dynamic growth was driven in part by smart state policies—such as the Regional Greenhouse Gas Initiative, Green Jobs Act, renewable portfolio standard, Global Warming Solutions Act, and Green Communities Act. For the second time in recent years, prosecutors across Massachusetts are confronting the possibility that thousands of drug investigations may have been built on flawed scientific ground — raising the specter of convictions being thrown out. That potential emerged amid disclosures that a former chemist at a Department of Public Health lab in Amherst was regularly high on the job and dipped into the lab’s stash of drugs for her own use. Those revelations have cast doubt upon tests performed at the now-shuttered lab. This case is one of several similar cases in federal district courts in Oregon and Washington, and in the state courts of North Carolina, New Mexico, Pennsylvania and Colorado. The demand from Healey’s office mirrors ones filed by attorneys general in New York and the U.S. Virgin Islands that press ExxonMobil on what its internal research dating back to 1976 said about climate change versus what the oil company said publicly. The debate over climate change is fraught with accusations that the other side is willfully lying about the facts in order to win. Now there are two academics out with a paper justifying lying about climate change in order to convince global governments to "do something" about it. Fuhai Hong and Xiojian Zhao, economists at Singapore's Nanyang Technological University and Hong Kong University of Science and Technology respectively, are publishing a paper in the American Journal of Agricultural Economics called "Information Manipulation and Climate Agreements," which argues that manipulation of information by the media will "enhance global welfare" by inducing countries to agree to environmental accords (IEAs). We show that the exaggeration of climate change may alleviate the problem of insufficient IEA participation. When the mass media has private information on the damage caused by climate change, in equilibrium they may manipulate this information to increase pessimism regarding climate damage even though in actual fact the damage may not be that great. Consequently, more countries will be induced to participate in an IEA in this state, thereby leading to greater global welfare ex post. The article purports to prove, with an economic model, that the urgency of climate change and the necessity of international agreement makes it okay to lie about the projected consequences of climate change. NEW DELHI: Wind energy developers in Maharashtra have alleged that the state power distribution utility owes them more than Rs 1,000 crore as it has stopped paying them since October last year, and said most projects are on the verge of collapse. "We're disappointed with what is happening in Maharashtra. Wind projects there are on ventilator. All assets will soon start defaulting and the state will be responsible," said Sunil Jain, president of Wind Independent Power Producers Association. A senior executive at a leading wind farm developer said the approach of Maharashtra State Electricity Distribution Co (MSEDCL) has impacted huge investments in the sector. "Top global investors such as Morgan Stanley, Goldman Sachs, IFC, CDC and more have put money into these projects. 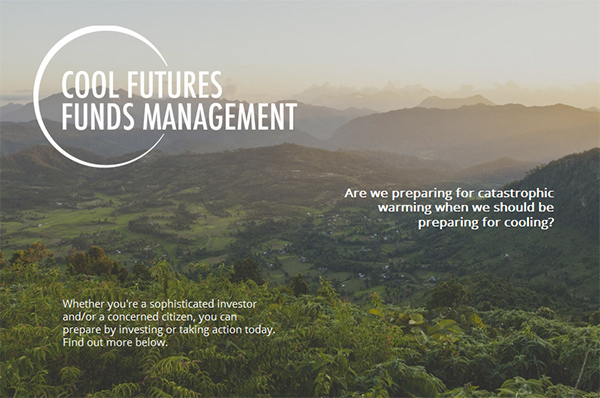 What will happen to their investments?" the person said. Germany's Siemens and Spain's Gamesa announced plans to create the world's biggest builder of windfarms on Friday, seeking to combine their respective strengths in offshore wind power and developing markets. Engineering company Siemens, which has struggled to make its wind turbine business profitable, will take a 60 percent stake in the combined company, a person with knowledge of the deal told Reuters. In return for taking the leading role, Siemens will pay Gamesa's shareholders, which include Spanish utility Iberdrola, 1 billion euros ($1.1 billion) in the form of an extraordinary dividend, the source said. The geared wind turbines continue to be plagued by numerous gearbox (more accurately the bearings within the gearbox), blade, mechanical, weather-related (e.g. lightning), design and maintenance issues. The failure of the bearings located within the gearbox is the most significant problem associated with the turbines This year, Siemens, a main manufacturer of wind turbines, reported a charge of 48 million Euros for inspecting and replacing defective main bearings in some onshore wind turbines. Structural and mechanical failures (which can result in a tower collapse) are primarily due to control system errors and lack of effective maintenance. If it was not for the government subsidizing of these systems, they would have never been built that way. 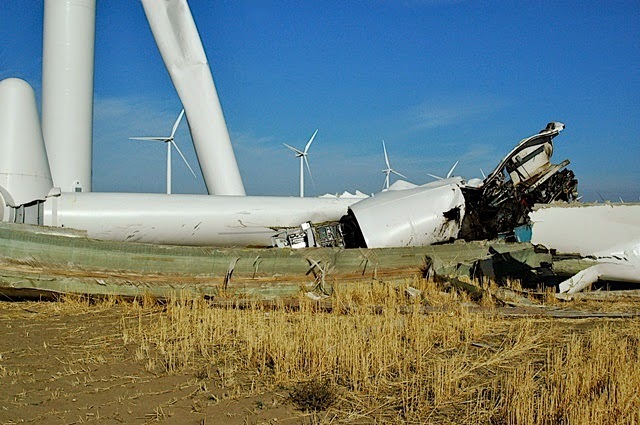 This blog addresses the major causes of failure of wind turbines. Largest US Offshore Boondoggle In The Works. Billions To Be Pissed Away. Bankrupt SunEdison's situation amounts to "hopeless insolvency," and therefore its shareholders should not have an official committee representing them in its Chapter 11 case, the renewable energy company said in court papers. SunEdison said in papers filed on Tuesday it faces more than $4.2 billion in prepetition claims, compared with $850 million it anticipates it can distribute after paying off its debtor-in-possession loan. Note: This is not to imply an endorsement. Alberta Passes Carbon Tax, Who's Next? Let's not hold out breath. Some prominent Climatologists who subscribe to the theory of man-made global warming want the University of Wisconsin to consider revoking Patrick Michaels' Doctorate, according to leaked emails uncovered as part of the brewing 'climategate' scandal. Michaels received his PhD in ecological climatology from UW-Madison in 1979 after he earned his A.B. and S.M. degrees in biological sciences and plant ecology from the University of Chicago. Since then he's served as a climatologist for the state of Virginia, a professor of Environmental Sciences at the University of Virginia, and was a contributing author and reviewer of the UN Intergovernmental Panel on Climate Change (IPCC). He's currently a senior fellow at the CATO Institute and is a Distinguished Senior Fellow in the School of Public Policy at George Mason University. According to his official biography, Michaels' writing has been published in the major scientific journals, including Climate Research, Climatic Change, Geophysical Research Letters, Journal of Climate, Nature, and Science, as well as in newspapers such as The Washington Post, Washington Times, Los Angeles Times, USA Today, Houston Chronicle, and Journal of Commerce. He was an author of the climate "paper of the year" awarded by the Association of American Geographers in 2004. With all these bona fides, why would his peers contemplate waging a campaign to undermine his credibility? Michaels is also a global warming skeptic. In September, he wrote an article for National Review accusing Phil Jones, a climatologist at the United Kingdom's University of East Anglia, and his colleagues of losing or destroying surface temperature data they used to develop their theories. You can read the whole article by clicking here. The Climate Research Unit at the University of East Anglia explained on their website "Since the 1980s, we have merged the data we have received into existing series or begun new ones, so it is impossible to say if all stations within a particular country or if all of an individual record should be freely available. Data storage availability in the 1980s meant that we were not able to keep the multiple sources for some sites, only the station series after adjustment for homogeneity issues. We, therefore, do not hold the original raw data but only the value-added (i.e. quality controlled and homogenized) data." That data was incorporated into a report by the IPCC in the 1990s, which in turn was used by the EPA in drafting its "Endangerment Findings." The endangerment findings determined that greenhouse gases are at unprecedented levels and are endangering the health and welfare of the public. Now, Michaels and the Competitive Enterprise Institute are petitioning the EPA to reopen the public comment period, because the data supporting the findings are unreliable. That allegation did not sit well with Phil Jones and his colleagues. Ben Santer, a climatologist at Lawrence Livermore National Laboratory, told Jones in an email on October 9, 2009 "I'm really sorry that you have to go through all this stuff, Phil. Next time I see Pat Michaels at a scientific meeting, I'll be tempted to beat the crap out of him. Very tempted." The Silencing Of Skeptics (Massive news database). "It is our freedom as Americans, particularly the freedom of speech, which generally allows us to express our views without fear of government sanction." According to Moody's, TerraForm Power faces potential default on 10 project-level loans because of different clauses, and TerraForm Global faces the same problems with five loans. And it's that project-level debt that could end up costing them millions in reserves, triggering higher interest rates, or even pulling them into bankruptcy. This is probably the most important paper I will ever write. Interesting links john. Good stuff. Thanks, John, for providing such interesting tidbits. I'm so appalled that free speech is threatened by these AGs. 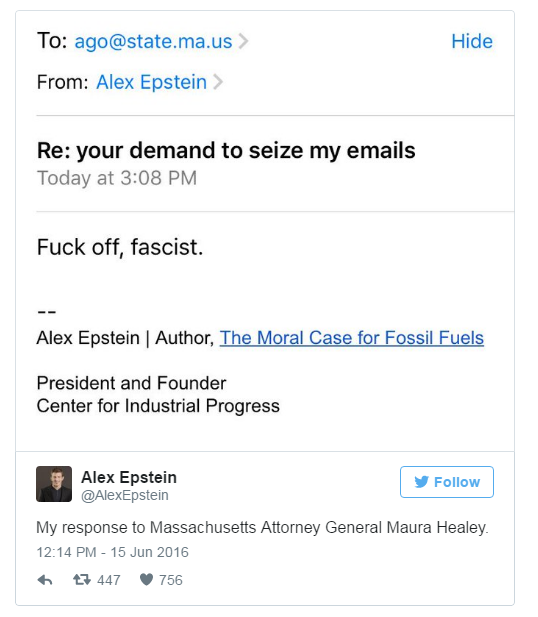 I love Alex Epsteins' vulgar but valid response to the MA AG (Witch). I also think Alex's $100,000 offer to Al Gore (unanswered) to debate him is fantastic. And, Max Baucus, also involved in the climate catastrophe summit, probably doesn't want to discuss Goldwind USA, the Chicago front for Goldwind of Xinjiang, that never did roll out manufacturing as Baucus told us would happen in the U.S.
Hawaii Free Press 'Meet the Environmental Protest Industry' reveals how conflicted and unhelpful NGOs can be. They appear everywhere in the media to promote industry v wildlife and humans. The degree to "Witch" they are willing to use fear as a tool to green-wash and separate citizens from our money is disturbing. "The activists need a bad guy and will create that narrative." Thanks again, John. I appreciate the sunlight! Is Eric Schneiderman a crook? Is the Attorney General of New York a crook? What exactly was that federal sentencing memorandum all about? Why isn’t Jon Corzine being prosecuted? And exactly what went on in a closed-door meeting between New York Attorney General Eric Schneiderman and President Obama — hours before Schneiderman filed a Saturday afternoon lawsuit against Obama’s famous critic –- Donald Trump? Sources say the ‘investigate Schneiderman’ movement is gaining traction among congressional Republicans, particularly in the House Financial Services Committee. One obvious reason: Schneiderman, a Democrat, seems to spare no expense in attacking critics of President Obama but hasn’t lifted an investigative finger when it comes to the sleaze involving fat cats in his own party. The case of Jon Corzine. Prometheus gets stumped in the name of science. Estimated to 5,000 years old. A lot of stuff happened in this trees time and it was fit to make a table. A geek tragedy. The sale is the latest move by SunEdison, which declared bankruptcy in April, to rid itself of its Maine assets. In 2015, the company also sold its Bingham and Oakfield wind projects to a division of J.P. Morgan and withdrew a Department of Environmental Protection application for a project in Hancock County. A 26-turbine wind farm has been planned by SunEdison in the Misery Ridge area of Somerset County, near Moosehead Lake. Terraform Power, a subsidiary of SunEdison, owns four other projects in Maine — in Mars Hill, Stetson, Blue Hill and Rollins. Towering turbines that sprouted from the ground in Northern Indiana were heralded by some as a green energy cash crop that paid leases to landowners and, by extension, property taxes to local governments. But as industrial wind energy tries to blow into other parts of the state, it’s running into resistance from communities that fear those turbines will overrun the landscape. Private developers are in an aggressive push to double the number of Indiana’s wind farms. But they must contend with neighbors, lawsuits and the fickle support of elected officials who once welcomed them — but are now changing their minds. The proposal exposes the corruption of IBEW 1245 leadership and IBEW 1245’s failure to represent its members. IBEW 1245 lied to its workers when it claimed to be fighting to keep the plant open; has violated its moral duty to represent its workers interests; and may be in violation of state and federal laws. Off Grid Living. Ron had contacted me back in 99-2000 to get advice on small wind for off grid power. I just came across this article and thought I would share it here. When seeking a quiet getaway, most people head to a beach house, cabin in the woods or another secluded spot to connect with nature. Bucks County native Ron Melchiore is not most people. And he was not looking for a vacation when he ditched his humdrum days of working in electronics for a life of self-sufficiency in the great outdoors more than 35 years ago. Melchiore, who was born in Philadelphia and grew up in Warminster Township, bought a 120-acre property in unorganized territory west of Bridgewater, Maine, in 1979. There, he made soap, raised animals and mastered other homesteading skills in preparation for his next remote residence, northern Saskatchewan, Canada, where he has lived with his wife, Johanna, since 1999. Thanks Gomp!. That was quite a read. In the Joint Stipulation of Dismissal, Mr. Walker said he would pull his March 15 subpoena of the world’s largest energy company, which had challenged the subpoena as unconstitutional. “After conferring on this matter, the parties mutually agreed that Attorney General Walker will withdraw the subpoena and ExxonMobil will stipulate to the dismissal without prejudice of this action,” said the four-page document filed in U.S. District Court for the Northern District of Texas. The alarmists knew damn well that pursuing this would backfire horribly in their faces resulting in their being sued under RICO etc.. The witch hunt is not over as the Dem(agouges)-crats have officially adopted persecution of science minded individuals who question the known false /manipulated data and narrative as the official party platform. A group of Democratic state attorneys general and former Vice President Al Gore have announced the creation of a coalition of “top law enforcement officials” to investigate whether oil companies committed fraud in order to hide the effects their businesses have on global climate. Speaking at a press conference at his Manhattan office Tuesday afternoon, New York Attorney General Eric Schneiderman said the group would look for “creative ways” to use existing law to investigate whether “fossil fuel companies” have “profited from the confusion” those companies have allegedly sown over global warming. Extensive debate ensued over the suppression of free speech, control of science, and other restrictive practices in a supposedly free society. It caused retraction of many of the charges and exposure of apparently unethical or even illegal activities by those bringing the charges. WUWT did a good job reporting and exposing the sequence of events. Did Exxon or any of the climate change deniers ever do anything like this? Is this committing fraud? Hansen’s information was apparently designed to “hide the effects of climate change,” natural climate change that is. It was designed to allow “profit from the confusion.” The profit was political at first, but became financial later for many like Gore and others. Hansen continued his distortion of the science even though, as Wirth said, he was working for the Federal government. He also continued his activism, including protesting and being arrested outside the White House in contradiction of the Hatch Act. Exxon or climate change deniers didn’t alter official modern weather records or alter historic records by eliminating decade long warm periods. They didn’t create a panel to study causes of climate change that only considered human causes. They didn’t let the public believe the panel was studying all causes of climate change. Exxon reportedly spent $16 million on climate research with virtually none of it going to deniers. Meanwhile, from the time Hansen appeared before the Senate Committee in 1988 to 2009, Gore, Wirth, and their political partners directed $79 billion to promotion of the unproven AGW hypothesis. It remains unproven. The total cost to societies from the implementation of unnecessary energy and environmental policies is in the trillions. It is clear who the racketeers are. But then, it may not be racketeering but politics as usual. The film, “The Big Short,” and the book, “No One Would Listen,” offer instructive object lessons on the dangers of blindly accepting a consensus, no matter how convincing it might sound. I recently had the opportunity to view, for the second time, the very amusing and instructive film, “The Big Short.” And, by coincidence, I just completed the fascinating book, “No One Would Listen,” by would-be whistle blower Harry Markopolos. And I could not help but notice a theme common to both works: the potential dangers involved in uncritically accepting a widely held consensus view. Harry Markopolos is a financial expert who, many years ago, figured out, on the basis of a critical analysis of the data, that Bernie Madoff was a fraud. Yet no matter how many times he tried (as I recall it was 8 times in all, dating back to 1999), he was never able to convince the Securities and Exchange Commission to properly investigate. Nor was he able to convince almost anyone investing with Madoff to look more closely into his operation. Why? Once again, the consensus of just about everyone in the financial world was that Madoff was honest, forthright, solid, reliable and completely trustworthy. After all, he had produced impressive returns year after year for a very long time, he’d been “investigated” by the “experts” at the SEC (in a half-hearted effort that turned out to be a sham), and passed with flying colors. Markopolos was routinely ignored, mocked, and dismissed as some sort of crackpot. After all, he was bucking an overwhelming consensus in the world of finance that Madoff could do no wrong. Ironically it was not Markopolos, who had him figured out from the start, but Madoff himself, who finally blew the whistle. There was literally too much at stake for anyone else to do so. The financial crisis anticipated by the protagonists of The Big Short shook the entire world and is still having dire repercussions everywhere. And if Bernie Madoff’s scam had been allowed to progress for another few years, his collapse might have had equally disastrous repercussions. I’ll leave it to readers to draw their own conclusions regarding any possible parallels with the consensus on climate change. Holman Jenkins Jr.: “Well the latest is that his campaign is completely unraveling. First of all, it was a phony-bologna case to begin with, that Exxon had done these studies in the 70s on climate change and then lied to the public about what it had found. It didn’t. It published these studies in journals and made them available to everybody and they’ve been available ever since, so there was no mystery here. The Senate Finance Committee and the House Ways and Means Committee on Wednesday sent letters to seven foreign and domestic companies in the solar industry, expanding a more limited probe started earlier this year. The recipients included three firms in the residential solar industry, SolarCity Corp., Sunrun Inc. and Sungevity Inc., and four solar utility companies -- SunEdison Inc., Abengoa SA, NextEra Energy Inc. and NRG Energy Inc.
A spokesman for SolarCity said the "answers to the questions posed are fairly straightforward, and we will provide them as requested." Officials at SunEdison, Abengoa and NRG Energy declined to comment. NextEra, Sunrun and Sungevity didn't respond to requests for comment. Ma AG gets schooled by judge for climate witch hunt. There are over 60 very concise and pointed questions in the above article. It is an ABSOLUTE MUST READ. John Halpern. Where have we heard that name before? Sounds familiar. I guess I will look into it.